Home » Blog » Detox » Want Some Spice In Your Life? Want Some Spice In Your Life? Let’s face it, we all have digestion issues at one time or another. It’s just that some of us have them more than others. Our diet, SAD, (Standard American Diet), today consists processed foods, combined with vices and less than ideal lifestyle choices, including soda, smoking, lack of sleep, alcohol, etc, can reduce the efficiency of the digestive system and our health. By now, we all know this drill. A well balanced diet, consuming a good portion of fruits and veggies, with lots of greens can help improve digestion, and this can all be boosted by adding a variety of flavorful spices that provide incremental digestive support. 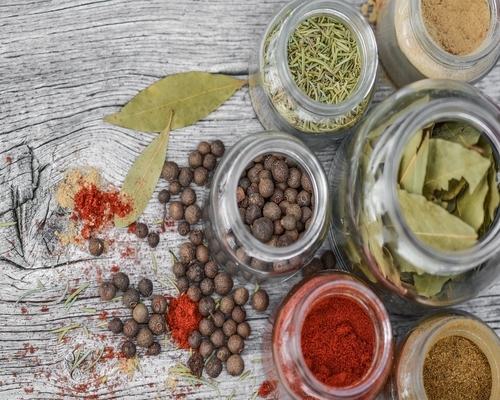 Spices and herbs have been used throughout the centuries as digestive stimulants. 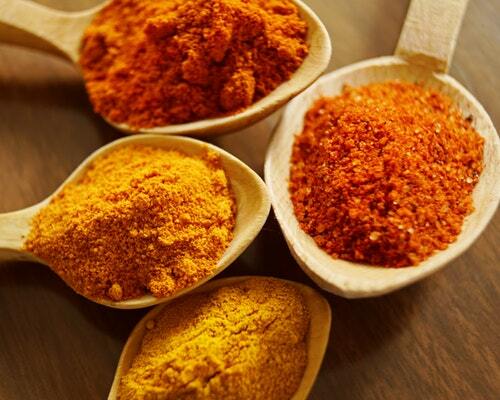 Studies have shown that there are multitude of spices which can stimulate the liver. When the liver is stimulated, it will secrete more bile with a higher percentage of acids which come into play with fat digestion and absorption. There are a variety of spices that have also been found to stimulate activities of pancreatic enzymes such as; lipase, protease, and amylase that help support and promote efficiency in the digestive system. Food transit time or the time it takes for ingested food to travel through the human gut, affects the amount of harmful degradation products produced along the way. This means that transit time is a key factor in a healthy digestive system. Food transit time, can be improved with spices. Slower GI tracts allows time for more water to be absorbed out of digested food that can result in constipation; the longer digested food is allowed to sit in the system before being eliminated, the more prone it becomes to being preyed upon by unhealthy bacterias. Some spices can even help to prevent gas, and help with their bloating, with their carminative properties that help to reduce bloating and flatulence. Ginger is part of the Zingiberaceae botanical family and it contains phenolic compounds which have been shown to help relieve gastrointestinal irritations, and stimulate saliva and bile production. Ginger has been demonstrated to enhance intestinal lipase, (fat enzyme), activity in animal studies. Intestinal contractions are reduced via relaxing intestinal muscles and allowing digested food to pass with more ease, the reduce cramping within the stomach and bowels may even help with menstrual cramping. 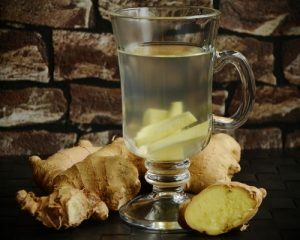 Ginger works wonders with helping to reduce gas, bloating, and other gastrointestinal distress such as nauseas due to chemotherapy and morning sickness without making you sleepy. Coriander seeds which yield cilantro, just as ginger, have been used for literally thousand of year to aid with digestion. Coriander helps relieve gas with its carminative properties, and is known to also have antispasmodic and stomachic properties that can help to calm intestinal spasms that lead to diarrhea which can settle indigestion and may help with irritable bowel syndrome. Cilantro is a great source of phytochemicals that are antioxidants which can help lower blood sugar, and has been shown to be a heavy metal detoxifier helping to suppress lead accumulation. Cardamom belonging to the Zingiberaceae botanical family is very helpful for digestion, and has been used for centuries in both Chinese and Ayurvedic medicines. Science also backs up its actions of carminative and antispasmodic properties that help to relieve gas, bloating, and slowing the rate of stomach muscle cramping. It also stimulates the appetite while easing nausea, gas, indigestion, and cramping. Cardamom also kills off food borne bacteria in the digestive tract helping to protect against food poisoning and gastric distress. Limonene compounds found within it are known to help dissolve cholesterol containing gallstones, relieve heartburn, and gastroesophageal reflux. It is a good source for antioxidant benefits, source of minerals, and works well as a diuretic that can help reduce bloating, swelling, edema, and water retention. Fennelseeds are another good source of carminative properties often used as an after meal digestive aid, with antispasmodic properties that can stimulate production of gastric juices. It is a rich source of dietary fiber and consists of metabolically inert insoluble fiber helping to increase the bulk of food consumed as it passes through the digestive system easing constipation problems and promotion protection of the colon. It also contains are variety of antioxidants including quercetin that may offer some protection from aging disease and some cancers. Turmeric also comes from the Zingiberaceae botanical family and aids in digestion while soothing the digestive tract. This well known and used analgesic, antioxidant, anti-inflammatory and antibacterial spice has been found to help relieve heartburn, reduce stomach pain, reduce flatulence, helps to fight off foreign invaders, repair damage, boosts the immune system, balances hormones, promotes proper digestion, and much more. 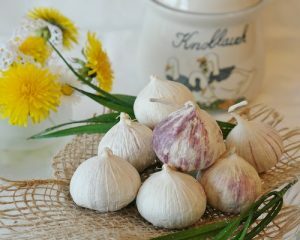 Garlic has a huge and well deserved reputation with many beneficial uses. Daily use of garlic aids in eliminating any digestive problems, assisting with normal functioning of the intestines, and any swelling or irritation of the gastric canal, aiding in digestion by destroying harmful bacteria while not harming useful organisms. 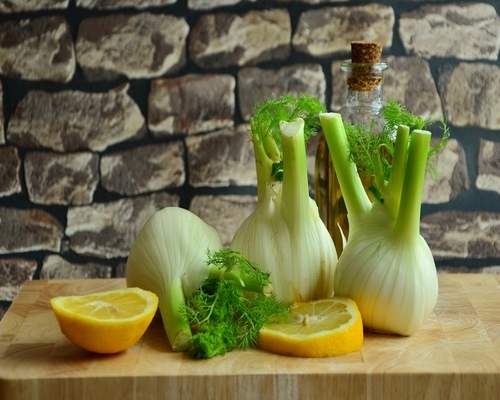 Garic acts as a detoxifier, eliminating negative bacteria, while aiding in digestion, and enhancing proper functions of the digestive tract among its other long list of impressive benefits. Lemon Balmis great for a variety of digestive problems such as upset stomach, bloating, intestinal gas, colic, vomiting, nausea, menstrual cramps, and flatulence. Lemon Balm can help to aid in a variety of functional gastrointestinal complaints with its ability to relax smooth muscle that can relax, relieve gas, stimulate bile production, assist with liver and gallbladder problems. Lemon Balm is an antibacterial, antioxidant, antispasmodic, antiviral, carminative, diaphoretic, and digestive aid among its long list of beneficial properties. Cinnamon Barkis warming and may be useful to help remedy sluggish digestion, loss of appetite, dyspeptic complaints, bloating, and flatulence. Cumin helps digestion and is great for heartburn. Fenugreekis a natural digestive helping to flush toxins from the body. There are many functional spices that not only spice of foods but aid in health and digestion. Any reputable herb and spice shop will be able to provide assistance with research efforts. It is best to store spices in clean airtight containers away from heat and light, some that spoil quickly may even do better in the fridge. Eating healthy does not mean that you have to eat bland foods. Go wild, Eat The Rainbow! Experiment with spices and find some new tastes that may help your tummy and health, in more than one way. Enjoy. Pound the chicken breasts to an even 1/2-inch thickness between two pieces of wax or parchment paper. Cut the breasts into 1-1/2″ pieces and set aside. Make the marinade by combining the soy sauce, dark brown sugar, lime zest, vegetable oil, garlic, curry powder, ginger, cardamom and salt in a large bowl. Add the chicken pieces to the bowl and mix until chicken is evenly coated. Cover the bowl with plastic wrap and marinate in the refrigerator for at least 4 hours or overnight. Make the sauce by whisking together the coconut milk, peanut butter, brown sugar, soy sauce and red curry paste in a medium saucepan. Bring to a simmer, then cook over medium heat, stirring occasionally, for about 3 minutes. Add the fresh lime juice. Set aside. Preheat the grill to high heat. Meanwhile, thread the chicken pieces onto skewers. Grease the grill. Place the skewers on the grill and cook for about 10 minutes, turning once, or until the chicken is cooked through. Serve the chicken skewers with the Coconut-Peanut Sauce and lime wedges, if desired. Registered Dietitian, Nutritionist, Functional and integrative Reiki Master. Practicing for 20 + years, Leukemia survivor. Presently living in the Washington DC and Pittsburgh PA area. Practicing virtually, remotely, and local. ← Is Your Sweet Tooth Out of Control? You Just Might Need More Sleep!